On this date in 1945 in Japan, two days after 40,000 Hiro­shima men, women, and chil­dren had died in an in­stant (90,000–166,000 would die with­in days of burns and radi­a­tion), U.S. air­planes carpet-bombed the coun­try with over five mil­lion leaflets. The leaf­lets described Hiro­shima’s utter devas­ta­tion and warned resi­dents of sim­i­lar destruc­tion across Japan until Tokyo agreed to the un­con­di­tional sur­ren­der terms spelled out in the Pots­dam Decla­ra­tion issued by the U.S., Great Bri­tain, and China on July 26, 1945. In the nation’s capi­tal the Japa­nese Su­preme War Direc­tion Coun­cil met to dis­cuss the coun­try’s options. Coun­cil mem­bers heard reports that 44 major cities had been largely destroyed. 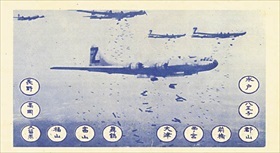 To­ya­ma, over 400 miles north of Hiro­shima in cen­tral Hon­shū, Japan’s main is­land, was the worst hit—99 per­cent destroyed when B‑29 Super­for­tresses dropped 1,466 tons of na­palm on the city. Another 37 cities, in­cluding Tokyo, were over 30 per­cent destroyed. (Actually over 50 per­cent of the capi­tal lay in ruins.) Eight mil­lion people were in­jured and with­out shelter, and civil­ian and mili­tary cas­u­al­ties approached two mil­lion. Despite the depress­ing reports, the Su­preme War Direc­tion Coun­cil could not come to a deci­sion until the next day, when the dimin­u­tive, myo­pic Emperor Hiro­hito per­son­ally inter­vened and ruled out approaching the Soviet Union or neu­tral Swe­den and Switzer­land for better peace terms. On August 9, 1945, the day of Naga­saki’s destruc­tion, the Japa­nese cabi­net and the Su­preme War Coun­cil voted to accept the Allies’ peace terms pro­vided Hiro­hito’s pre­rog­a­tives as em­peror were pre­served. The Allies worked out a face-saving com­pro­mise where­by Hiro­hito could stay on his throne “sub­ject to the Su­preme Com­mander of the Allied Powers,” Gen. Douglas Mac­Arthur. Approved by Pre­si­dent Harry S. Tru­man, the Japa­nese sur­ren­der docu­ments were sent to Mac­Arthur. Again U.S. air­craft took to Japa­nese skies, drop­ping mil­lions more leaf­lets ex­plaining the posi­tion reached in the sur­ren­der nego­ti­a­tions. On the same day that Hiro­hito was to broad­cast Japan’s accep­tance of the Allies’ terms, over one thou­sand sol­diers stormed the Imperial Palace in an effort to pre­vent the recorded mes­sage from being broad­cast. They were beaten back. 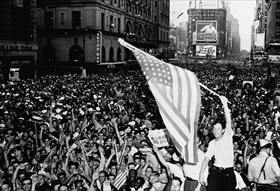 On news of the surren­der, the Allies prepared for the occupation of Japan. 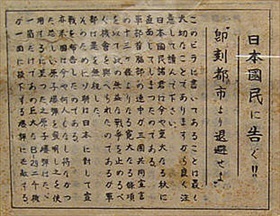 Right: A leaflet dropped from a B‑29 on Japan after the bombing of Hiro­shima, which caused wide­spread panic in many Japa­nese cities. Trans­la­tion: Notice to the Japa­nese People! Eva­cuate the city imme­di­ately. What this leaf­let con­tains is ex­tremely impor­tant, so please read care­fully. The Japa­nese peo­ple are facing an ex­tremely impor­tant autumn. Your mili­tary leaders were pre­sented with thir­teen arti­cles for sur­render [i.e., Potsdam Declaration] by our three-country alli­ance to put an end to this un­pro­fit­able war. This pro­po­sal was ignored by your army leaders. Because of this the Soviet Republic inter­vened. In addi­tion, the United States has deve­loped an atom bomb, which had not been done by any nation before. It has been deter­mined to em­ploy this fright­ening bomb. One atom bomb has the de­struc­tive power of 2000 B‑29s. This frightening fact should be under­stood by you by observing what kind of situ­a­tion was caused when only one was dropped on Hiro­shima. This leaf­let caused wide­spread panic in many Japanese cities. 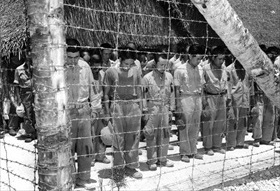 Left: U.S.-held Japanese POWs bow their heads after hearing Hiro­hito’s sur­ren­der announce­ment, Guam, August 15, 1945.